A while back, I came across this collection of unusual Google Earth finds. It's an impressive list and worth taking a few minutes to gape at. Regardless of whether it was happenstance or an act of architectural subterfuge, government officials in Iran were incensed this week when they discovered the outline of a Star of David atop the roof of the headquarters of Iran Air, Al- Arabiya reported on Monday. 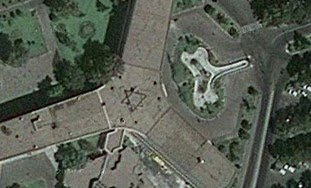 The six-pointed star was discovered by an eagle-eyed Google Earth user recently, over three decades after the building that houses the national airline of the Islamic Republic was constructed by Israeli engineers. That's awesome. I love it!